Dan J. Sheehan Company, Inc.
2006 Commercial Interior: Award of Excellence by the M.I.A. In 1886 the Telfair family opened their Savannah mansion to the public to establish the oldest public art museum in the south. After 120 years, the continually growing museum found itself in desperate need of new exhibition and educational space. 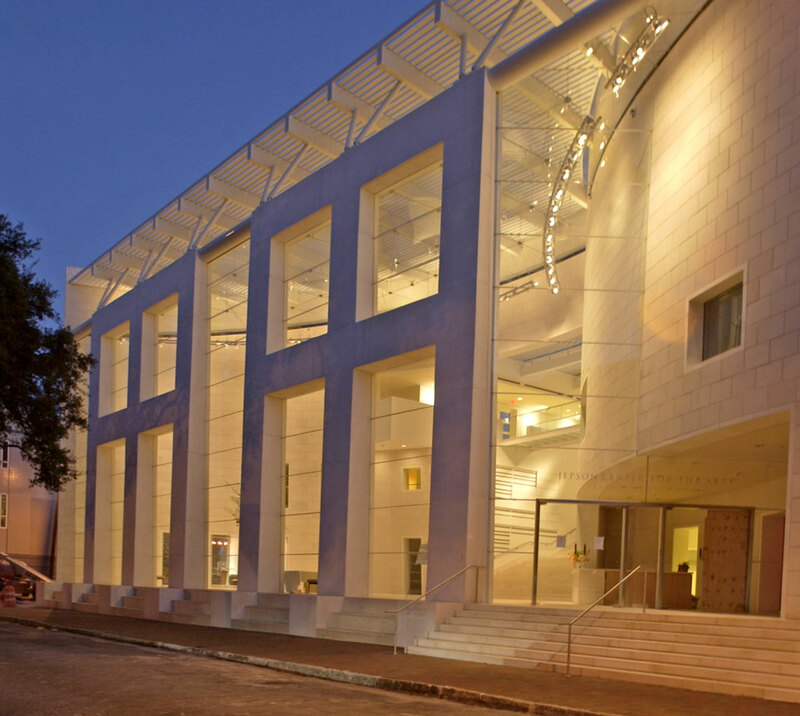 By opening the Jepson Center for the Arts on the two adjacent lots to the original c.1819 home, the Telfair museum brought about a new era for both the museum and the city of Savannah. 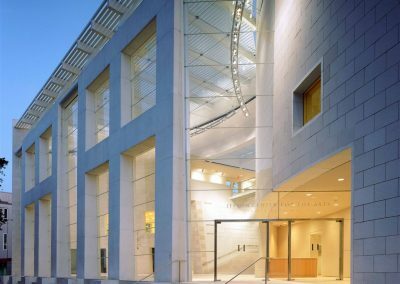 The Jepson Center adds a contemporary twist to the city, yet still manages to complement its 18th and 19th century surroundings. 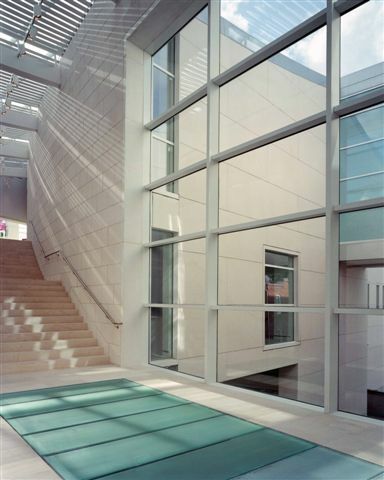 A modern design was absolutely necessary for the Telfair Museum’s Jepson Center. While it would have been much easier and less controversial to design a mock 19th century structure, this would not have done justice to Savannah, or to the progressive museum itself. 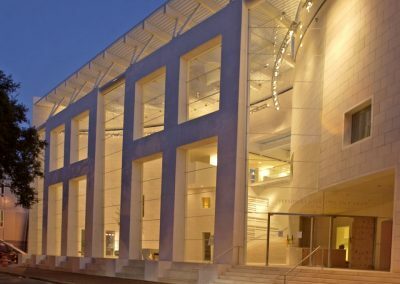 The Jepson Center now houses an expansive collection of everything from expressionist paintings to Chinese robes. The Telfair needed a modern, accessible space that could at the same time intertwine with both the pre-existing mansion and with the character of Savannah’s National Historic Landmark District. 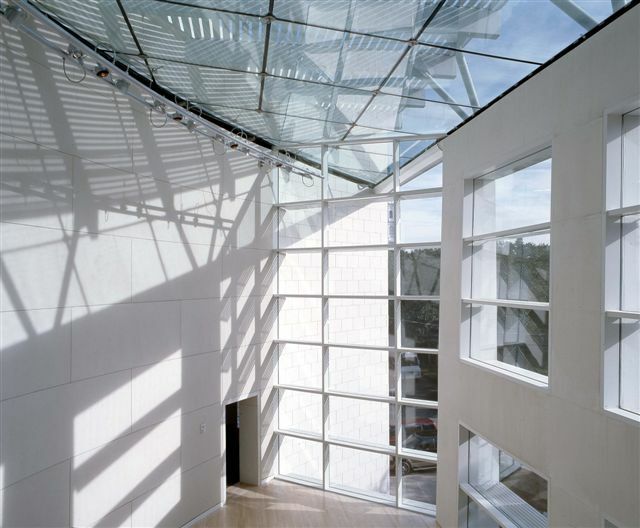 For this daunting task, the museum chose renowned architect Moshe Safdie. 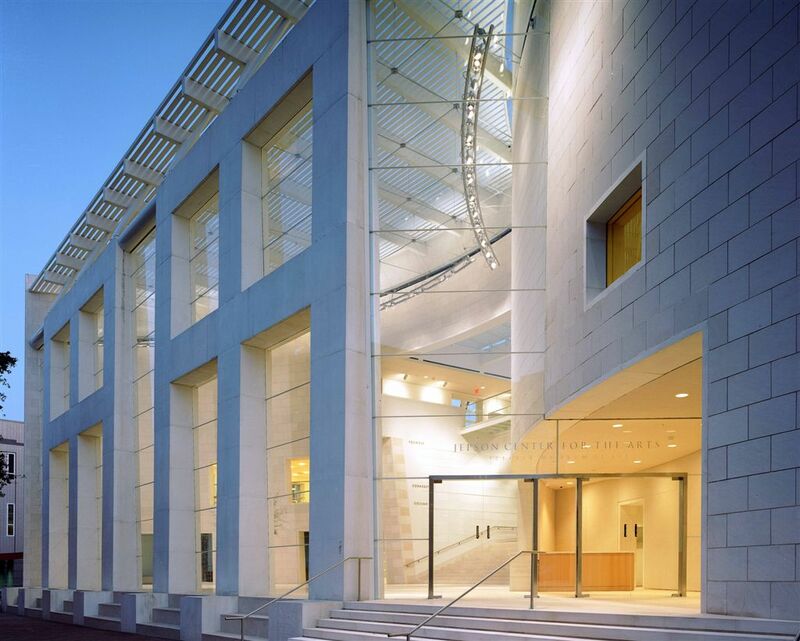 Safdie’s choice of old stone provided the backdrop for the graceful integration of this ultramodern monumental sculpture into Savannah. 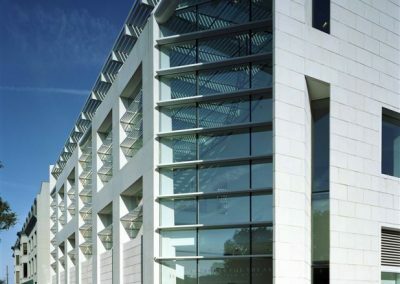 The same limestone separated by glass walls flows through the building’s interior and exterior, blending its modern geometry with the color pallet of Savannah and in turn opening the center to its surroundings. The accessibility of the 64,000 SF building is astounding. 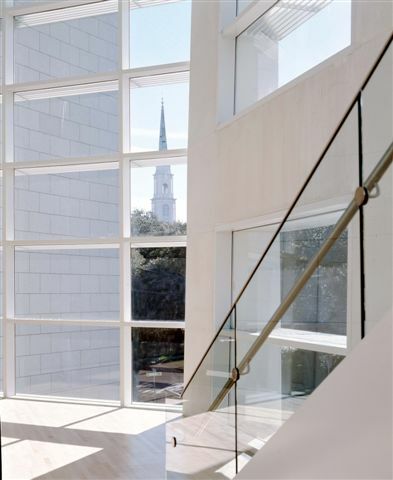 The Jepson Center’s guests view the city from nearly every angle, and Savannah welcomes the sight of its new city landmark. Because of its location, the Jepson Center was required to comply with General James Oglethorpe’s original 1733 city plan. Because of the importance of continuity within the Telfair museum, it had to complement its counterpart 19th century mansion and the surrounding district. Savannah’s Historic Preservation Review Board required the lane separating the two lots on which the Jepson Center lies had to remain in order to comply with the original city plan. Accordingly, the structure actually consists of two buildings connected by a third floor walking bridge. 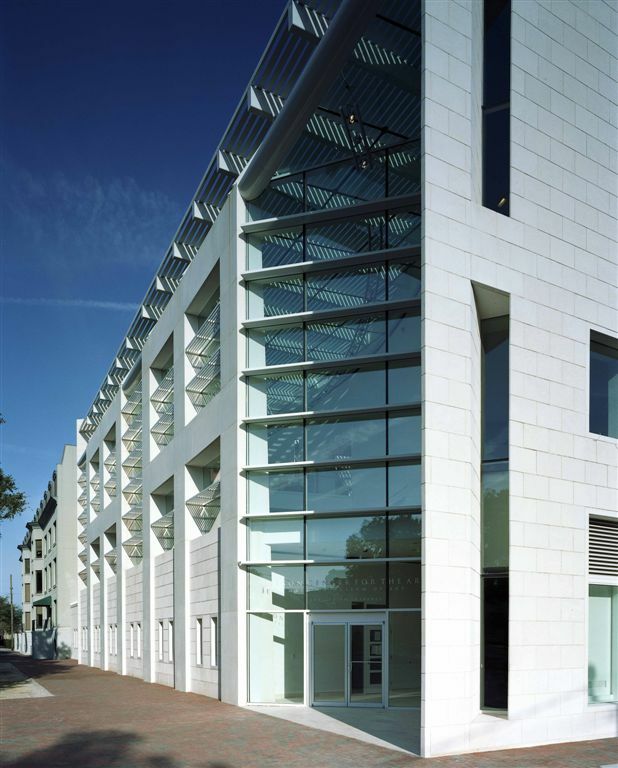 The entire design had to pass Savannah’s ultraconservative historic review board requirements, and the choice of stone was integral in bringing the contemporary into old-world Savannah. 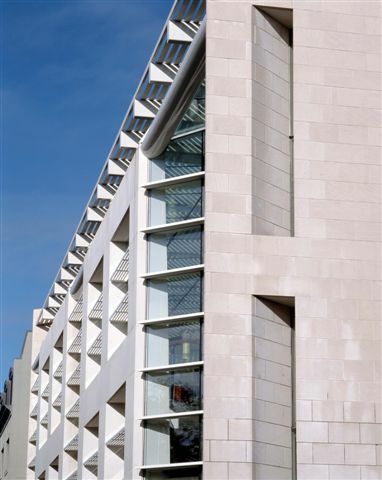 Dan J. Sheehan Company worked with the architect and general contractor to locate limestone cladding suitable for both interior flooring and exterior façade. Not only did the stone have to meet these requirements, it had to endure Savannah’s unforgiving humidity and salt air. 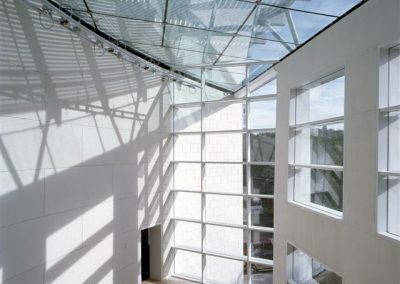 Safdie had originally sought after French limestone, but it quickly proved too expensive for the project’s $25 million budget. With the help of the Atlanta-based consultant Jeff Matthews of Trade International, Safdie was sent to Henraux S.p.A. in Lucca, Italy to inspect possible stones selected for the project and found a Portuguese stone that had not even been considered. 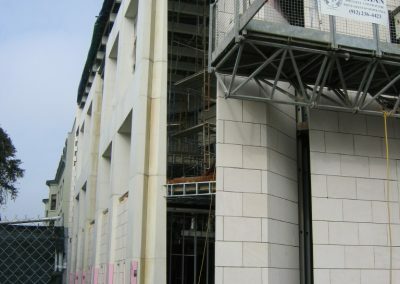 After rigorous testing, the stone held to specifications and was quarried in Portugal and fabricated in Lucca, Italy. The stone selection was just one of many obstacles in this project. 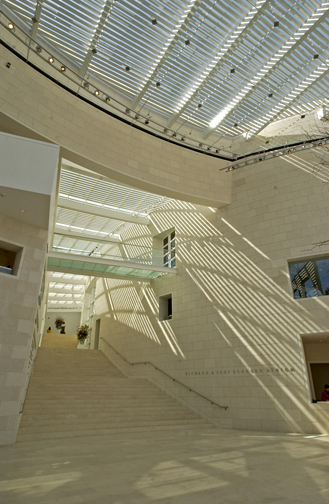 With concave, convex, and conical walls flowing through both interior and exterior, the intricate geometry of the Jepson Center made stone installation a challenge. 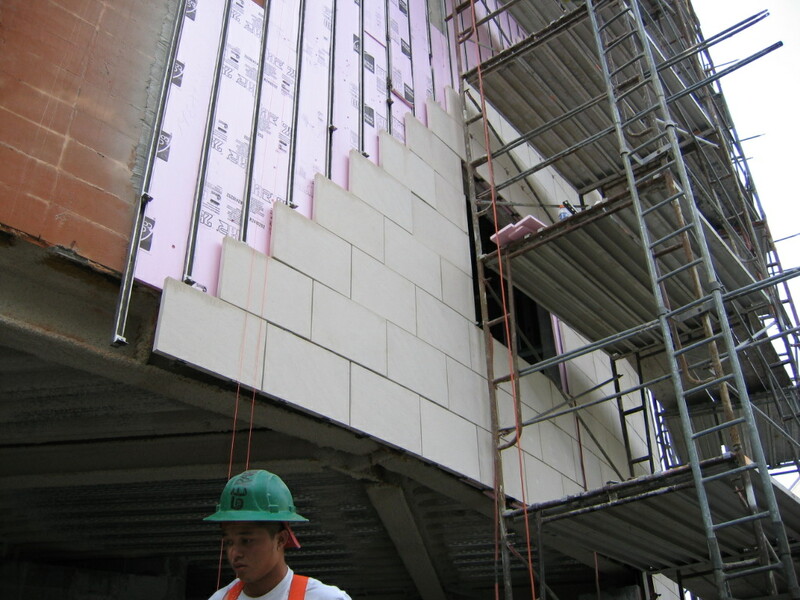 At 40-55 lbs per panel, the near 690,000 pounds of stone proved cumbersome and was not well suited to conventional installation. In addition, installation methods proposed by the architects were of great concern due to costs. Upon the advice of Façade Forensics and D.R. 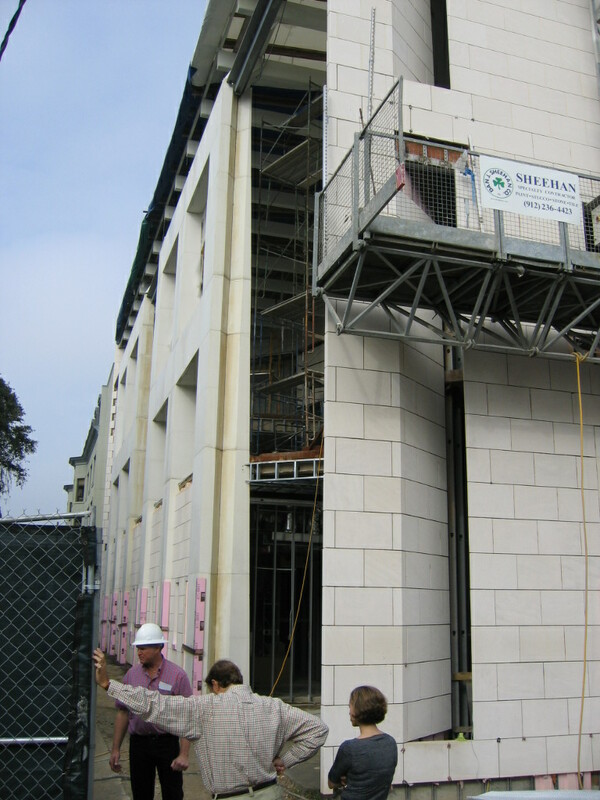 Cowen certified structural engineers, vertical struts, custom brackets, and individual anchors were used to mount the 22,000 SF of limestone. The exterior stone was anchored by a clip with a dowel pin and installed on a vertical strut system consisting entirely of stainless steel so as to endure Savannah’s sub-tropical climate. 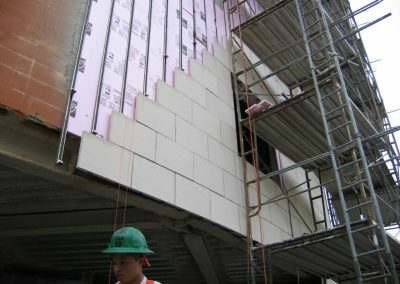 Although this novel framing system used more expensive materials, it made the wall installation process both faster and more accurate. The additional 11,000 SF of stone flooring consisted of the same Portuguese limestone, fleuri-cut unlike the strata-cut walls. The floors were set in a mortar bed with a cleavage membrane and reinforcing wire topped with a thinset application. The most important aspect of the floors is the 4-mil polyurethane sheet that separates the floor stone with the walls to prevent bonding that could lead to cracking.